Poetry month came and went. I did it right by reading tons of it: John Ashbery, Charles Bukowski (my first ever, if the internet can believe that), Adrienne Rich (all-time favorite still), Peter Campion, Juliana Spahr, Angela Sorby, Richard Siken, Ocean Vuong, Campbell McGrath. I think I may just extend it to make 2014 my year of poetry, much like 2013 was my year of women writers. It looks like it’s headed that way regardless. 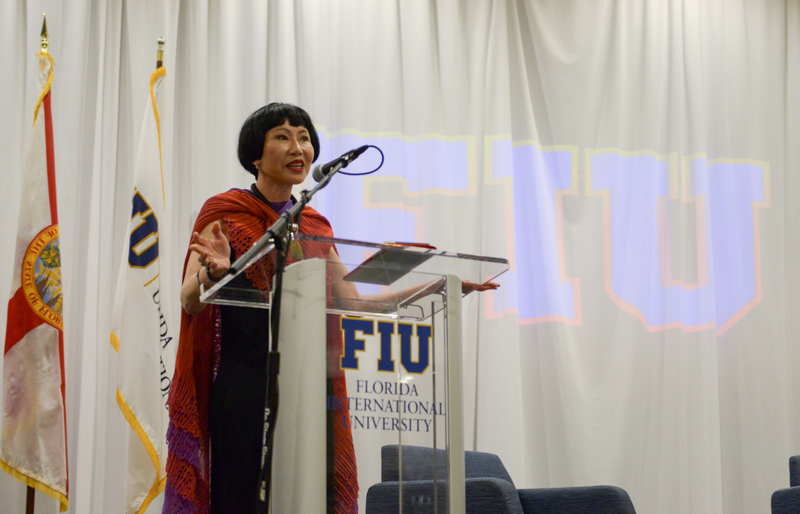 About a month ago, I met Amy Tan. She was at FIU, my alma mater. The university presented her with the Lawrence Sanders award for her contribution to literature. I first read The Joy Luck Club in high school, one of the books that inspired me as a teenager to take writing more seriously. Her fascination with an indomitable mother figure also resonated. Her speech at the ceremony was funny and heartfelt. She discussed the idea of the writer’s brain being more porous, having less barriers. Her husband of 40+ years was in the audience with their little dogs in a bag. The next day was their anniversary and they were heading out to Key West to celebrate. Ms. Tan talked about the Dry Tortugas and how she wanted to swim with the sharks. She signed my copy of her newest novel: To Joseph, joy and luck. I didn’t go to AWP this year, even though I’d been invited to do a reading at an off-site panel that focused on videogame writing. I’ve actually never been to AWP. It’s on my bucket list though. From what I’ve gleaned from Twitter, AWP always seems like a huge frenzy that causes a lot of exhaustion. But hopefully fun exhaustion. I would especially love to meet some of the editors from the literary magazines I read. And of course, maybe I’ll even bump into some writer friends that, up until this point, I only internet-know. Speaking of internet friends, thanks to some help from Adam, I was recently able to start a Goodreads author page. You can now become a fan of me. Oh wow. It might make it easier since my blog posts will also update through Goodreads now. If you’re into that. And of course, my constant barrage of books. 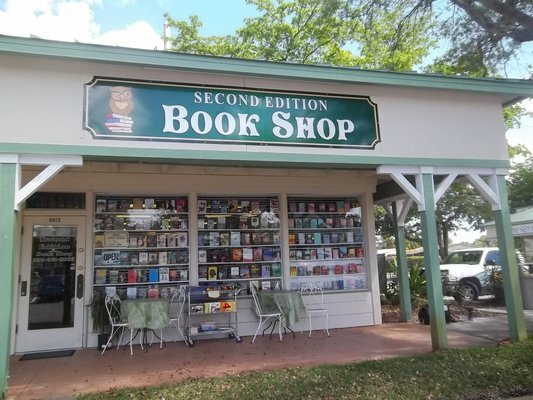 In the past couple of months, I’ve managed to stumble upon a few bookish places in tight little corners of South Florida. I am always on the lookout–especially since there are hardly any bookish places within my immediate vicinity. I sometimes feel so culture-starved. One of these places was Second Edition Books. I went with my sister, who is always up for an adventure. She bought some Shakespeare, I bought some Lorrie Moore. There were shelves and shelves, stacks and stacks. It was crammed full. 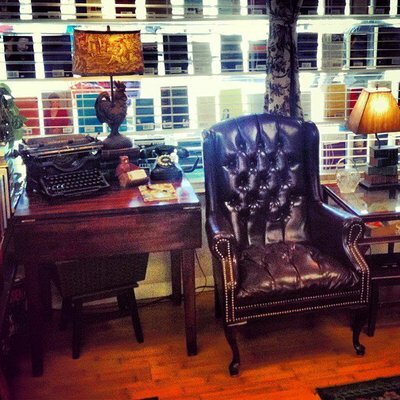 The bookstore provides a very homey atmosphere–rustic interior and leather armchairs. We sat in them and looked for the Great Catsby, the bookstore’s mascot. Catsby the cat lounges around the books. My sister pointed out that he also has an Instagram with a huge amount of followers. 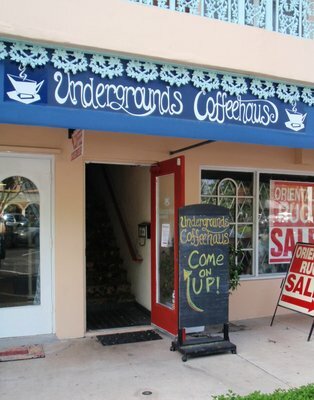 Another place I found was the Undergrounds Coffeehaus. The first thing I noticed: it’s not actually underground. 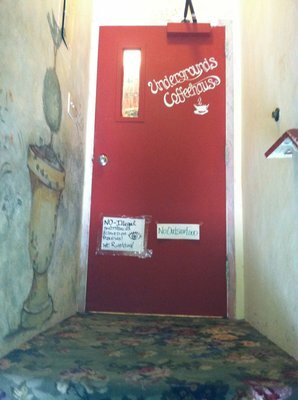 In fact, you have to climb stairs to get to the door, where it warns you that no illegal substances are permitted beyond the threshold. Already I think we’d found a place with a distinct personality. Inside, there is a playful kind of chaos: board games set out on tables, shelves of books against walls, knick-knacks scattered all over. It seems like a good local hangout spot for artists and youth with that kind of alternative edge. Tattoos and green hair. They serve tater tots and lots and lots of different coffee and teas. When I’m not exploring books nooks or working now, I write letters–actual paper and pen–in order to fill the void where the incessant blogging would be. If you wish to start an exchange, you can let me know at lettersforburning@yahoo.com. I promise I won’t burn them–not this time.